Despite a decent basketball career UCLA, Darrell Allums only lasted one season in the NBA, where he played 22 games for the Mavericks in 1980-81. 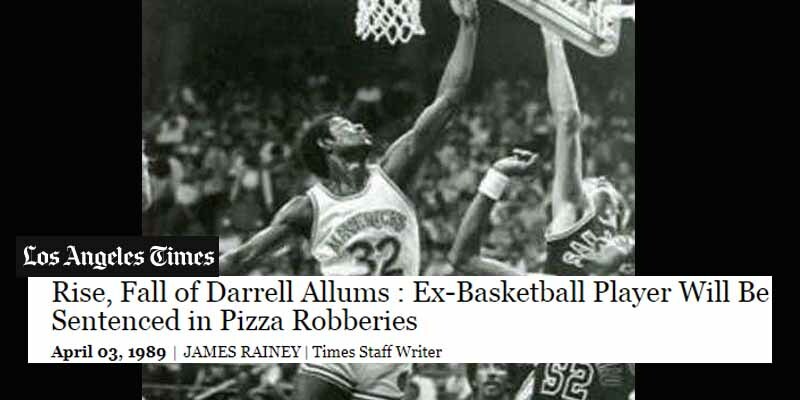 After basketball, Allums needed to make a living, so he turned to robbing Dominos delivery drivers, something most people turn to when in need of money…. For shame Darrell! Those costs are passed down to other consumers! He was convicted of robbing 14 such delivery persons in 1989, and sentenced to nine years in jail.